Paintmonkey Studios: Ringing In The New Year! According to some old superstitions, what you do on New Year's day is what you will be doing all year long. I don't know where this idea came from (I tried to find it online but no luck) but I kind of like that thought. So I decided I was going to be finishing a piece of art on New Year's Day. And unlike so many of my brilliant ideas, this one actually worked! 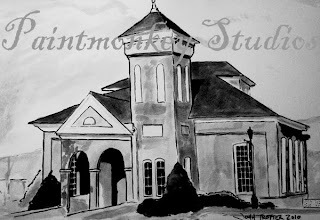 I got done with an ink wash of my alma mater's chapel. Okay, so it's not a 36"x48" oil painting but hey, I got it done! And it's just a quick study to prep me for a painting of the chapel to be done in the next few days. So in the next few days keep an eye open for an oil painting of our favorite little chapel in the mountains.